← 1st Three School of PACT Video Podcasts Now Available. Back in mid-1986 and I did my 16th CAD – Curriculum Architecture Design project – and I’d only done my first in 1982. By now in 2008 I’ve done 74 – my last was in 2004. But this was the only project that resulted in a video introduction to the Curriculum Architecture as one component of the communications/marketing strategy. But back then in 1986 our consulting firm (that later became SWI – Svenson & Wallace, Inc.) had already published on our group process approach to Curriculum Architecture design in Training Magazine (9/1984) – and on the analysis methodology used in Curriculum Architecture design using both Performance Models and K/S Matrices in NSPI’s P&I Journal (11/1984) – as key drivers later in the Curriculum Architecture Design process. The Client at Network Systems was so excited about the CAD produced – which was just a blueprint of what they had and what they needed/the gaps. And then they were very excited about the initial instructional products that they hired me to produce – that they let me talk them into producing 3 really cool communications/marketing pieces to support the roll out/implementation of the CAD’s key courses and the plans for addressing the gaps. They created a 1-colorful T&D Path poster for each of their sites – and they produced 2-a bound T&D Planning Guide for all supervisors of the Target Audience – and 3- a video overview of the CAD and planning process for they and their supervisors to follow – which was distributed on VHS – to ‘splain it all – as Ricky R. might say. That 16th CAD was for Product Planners and Product Managers of AT&T Network Systems – the old Western Electric of the old monopoly Ma Bell – and then that became Lucent – and then Lucent–Alcatel. This was all post-MFJ – the modified final judgement from the Justice Department that broke up Ma Bell. The CAD produced was modular and offered modules. Note that modular means lots of pieces/ components/ offers. And Modules is an early term for what I now call T&D Events – which are composed of T&D Modules. A “modular curriculum” suggests many piece parts to some – and to others it just means it’s been chunked/ segmented/ etc. If an Event were a book, then a Module would be a chapter – at least at the CAD level of PACT. In MCD Modules convert to Lessons and Modules disappear from the design maps and specs that guide development. CAD s are done to rationalize existing content and identify and prioritze gaps for ADDIE-like efforts – as the business situation dictates. 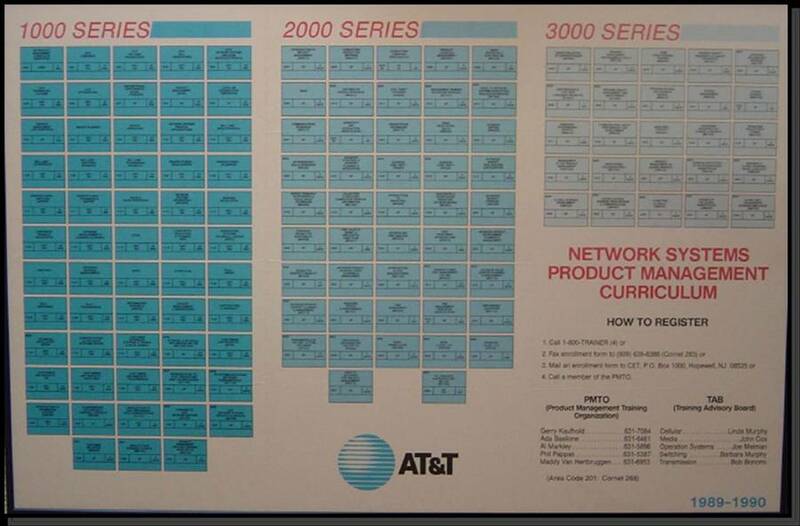 Doing CADs at the design level changed very much for me due to this series of projects for the PM function at AT&T Network Systems – from 1986 to 1992. I spent about 60% of my consultant billable time over those years working on ISD efforts for them. I learned a lot of systems engineering and modular component design concept – that I began to apply them to CAD – taking the CAD design concept from one level – Modules – to 2 levels: Events and Modules (within Events). That two levels of design enabled me to increase future shareability for other Client Target Audiences – in fact many others purchased many seats and sets of Self-Paced materials from my Client – funding additional development efforts. I did a CAD for these PMs and for NS Sales Representatives, and then NS Sales Managers, and then several technical areas where the CAD was for a cross-functional team – and didn’t cover all of their jobs – just that part of their jobs that were involved in the defined “process” or “processes” were were focused on/scoped by. I even did two other Product Manager CADs for other parts of AT&T. But this PM CAD for Network Systems was the first of those projects. After a couple of years working with AT&T-NS – all of my CAD designs were of the 2-level type. The T&D Path (or Menu) is a marketing poster – and I’d have these produced on blueprint paper – and called the early Paths “Blueprints” – and I would suggest that my Client hang them on the walls wherever the Target Audience got their coffee, etc. “Rest room walls then!” – I even suggested to one client who had said that that was the only common space in their situation! The Target Audience members for the AT&T NS Product management functions – in 5 SBUs – Strategic Business Units, numbered over 1100, and were predominately in 6 large sites and 6 smaller sites – and so they generally sat close to each other – within their SBU. Still, we tried to avoid lots of GP – Group-Paced training – as that was too restrictive for these jobs. We needed a high level of modularity back in 1986 as the incoming knowledge and skills varied tremendously – and the jobs that each individual would go work at – could be very different from their cube neighbor. Yes, there were many, varied jobs – we used to joke over 1100! – under the heading of Product Planner or Product Manager – all mixes of the sub-elements of the 8 “functions” we defined via our analysis process. This is not atypical in large corporations/organizations. So the CAD had to be “robust” to all of those variations. Hence – the very modular CAD. These 1100 were responsible for managing literally billions of dollars – dollars invested in products in design, in development, being manufactured, ramping up or down or seasonally adjusting, managing sales, distribution, installation and service offerings as part of a Product Plan, or Product Family Plan or SBU Plan. Eventually most products would be heading down the Product Plan path into “discontinuance” – as there would likely be new technologies being developed at Bell Labs – it wasn’t planned obsolescence as much as push the technology faster and shoortening the cycles between new releases!!! This was a critical job – the PM job – and had high risks and high rewards potential for AT&T-NS. So they hired my firm to do a CAD. And then they would build or buy the critical gap content that the CAD pointed out. My partners and I did the analysis – dozens of interviews – we did not use the group process. Then I did the CAD “design” – by myself – using all of the analysis data we had – and the modular curriculum architecture that is visually portrayed in the T&D Path below was the result. 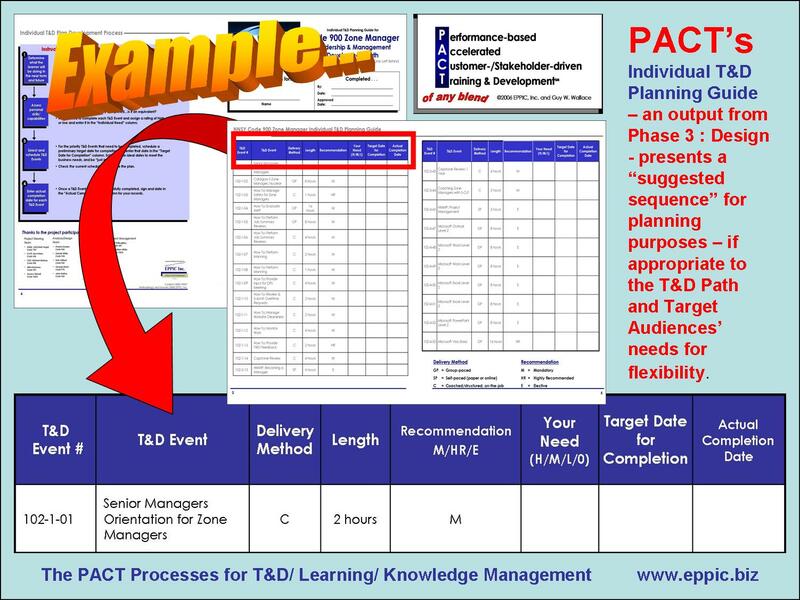 Nowadays I produce a fairly colorful poster of the T&D Path – 3′ x 4′ sized – and a “companion piece” to the T&D Path – for conducting a quick gut-check acid-test review in the Project Steering Team’s Gate Review Meeting – at the end of the Design Phase – and that companion piece is the Individual T&D Planning Guide. It simply lists all of the T&D Events (which are modular themselves) in a suggested sequence that can easily be adapted to unique needs of the job for that individual. If they “exist” that is noted. If it doesn’t exist yet or ever – it is so designated. When there is nothing – it is being left to Informal Learning in today’s parlance. More on that later. Back to the Planning Guide. I always ask the PST members to take 10 minutes and use it themselves on anybody they know now today, or for someone else or even on themselves from “back-in-their-day” and develop a specific plan for the development needs of that person. They process the following: which events are/were needed for the job assignment (which parts of the PM model were part of this person’s job), when was it needed over the next planning period (typically a year)? What were the priorities: High/ Medium/ Low? When was a reasonable target for starting and completion? That usually blows them away. I give a 2-minute warning and then cut them off after the 10 minutes – ask them to stop – and to report out whether or not the “Event titles and deployment method and lengths” made sense – seemed reasonable. And that the sequence seemed logical. Then I ask them “Event-by-Event” for a show of hands what was included on their plans. Many in the minority feel compelled to explain, and it was always rational. Yeah, I would have taken that had I not spent 6 years in the so-and-so department cleaning up after this groups’ messes. Enough said. We moved on through all of the Events. They totaled up the time burden learning phase by phase (or Block by Block) and compared and contrasted. It is always eye opening for them – and they really “internalize” the CAD project’s key deliverable to that point. Then we review what is and what isn’t on that Path. What Events exist and what do not. Anything that does not exist is “what I use to call” U-OJT: Un-Structured OJT – On-the-job training. Again, nowadays it would be called Informal Learning. I still occasionally slip and refer to it as U-OJT — Unstructured OJT. At least we named it – and it could be upgraded to S-OJT: Structured OJT fairly inexpensively. The next phase of the CAD project – Phase 4 Implementation Planning – was to target which of those CAD gaps needed to be addressed and content developed/acquired to make it Formal Learning. By Design. Due to the ROI and the Rewards to be gained and/or the Risks to be avoided. They – the PST – has to decide whom to empower to set the priorities – they themselves – or others closer to the job and the consequences for lack of knowledge and skills of their staff. It is usually off-loaded to the Implementation Planning Team, assembled in Phase 4 after being hand-selected by the PST. This AT&T Client had me develop the 1050 series of Modules – covered in an earlier Post – which included me “farming out” the video script development to Mark Bade – and him then bringing in John Leben for the video production. My clients Gerry Kaufhold and Jim Costello helped. 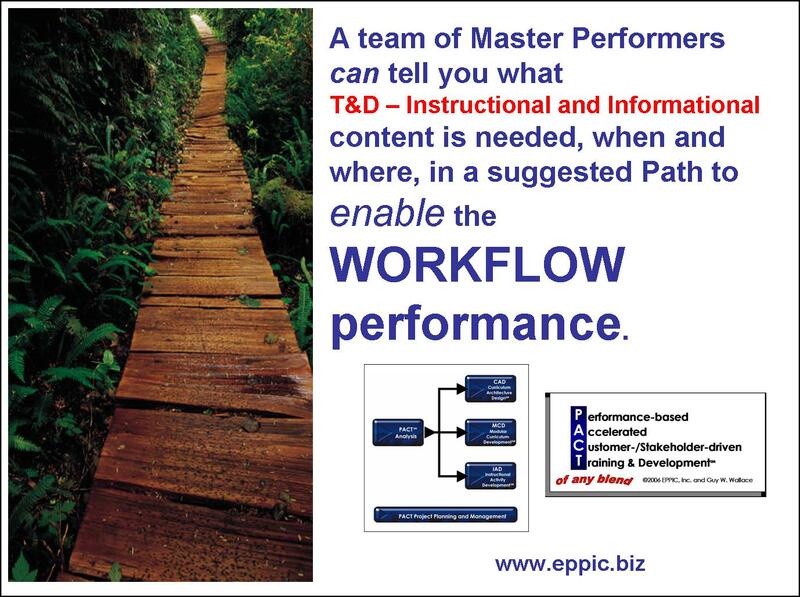 The PACT Processes were not my marketing label then – it was all about performance-based CAD. PACT evolved in the late 1980s into the early 1990s. 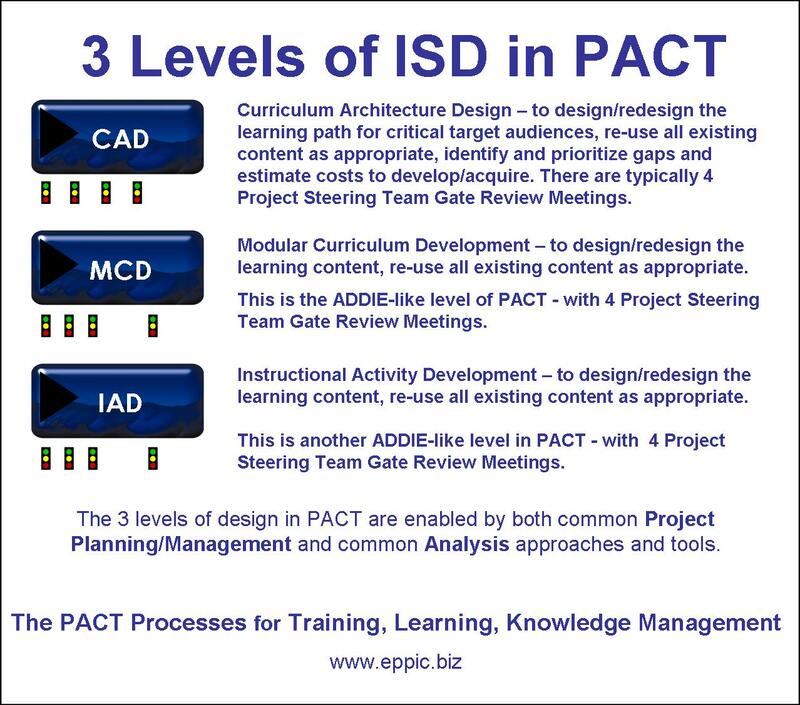 Then PACT reduced to practice the ADDIE level of ISD that included the continued use of the Performance Model and K/S Matrices – but then had a group process for the design step as well. That was first formally accomplished – the group process for an ADDIE-level project – in a Labor Relations project I led for SWI for our Illinois Bell Clients then in 1990. That was my first use of The Lesson Map. And use of the data of the Performance Model and of the K/S Matrices in a systematic process to create the designs – backward chaining on the Lesson Map – from Appo to Demo to Info. Or rather, typically Infos. For Formal Learning – when Learning By Chance won’t do. Empowerment of the Master Performers is one of the keys to success in PACT.